Many musicians suffer ear damage. Professional orchestras have therefore taken measures in recent years to reduce the sound levels. Studies now reveal that physical measures, like placing screens between sections or creating more space between them, have little effect. This is due to one’s own instrument contributing just as much to the sound level that reaches the ear as all the orchestra’s instruments together. So experienced musicians that play alone at home – whether professionals or amateurs – also produce excessive sound levels. The only solution that really helps is earplugs. The eardrums of trumpet players and flute players are the most burdened. During loud passages they are subjected to average decibel levels of 95 to 100 dB(A), just from their own instruments. The violin and viola produce decibel levels in excess of 90 dB(A) for their players. These levels are similar to those of a rock concert. They also well exceed the 85 dB(A) limit that European regulations stipulate for the compulsory wearing of ear protection on the work floor. Acoustics expert and researcher Remy Wenmaekers got these results using a calculation model he developed to work out the level of sound close to the ears of musicians. Wenmaekers chose to use a calculation model rather than measurements on the spot where musicians play their instruments. The reason is musicians never reproduce exactly the same level of sound, which makes comparison of experiments with ‘real’ musicians virtually impossible. As a foundation for his model he used recordings of orchestra music per instrument made in an anechoic chamber (a room without an echo). The model takes account of the direction of the sound of the instruments, the listening orientation of the receivers, reflection of sound, and blocking by people (the musicians themselves). He compared the results of his model with measurements in a real orchestra and there appeared to be a good correspondence. This video shows the sound levels at the ears of musicians as calculated by Wenmaekers’ model, for the first two minutes of Mahler first symphony (4th movement). It clearly shows sound levels exceeding 100 dB(A) repeatedly. Using his model Wenmaekers calculated the effect of the most commonly used sound-reducing measures, like screens and higher plateaus for the different sections in the orchestra. Those effects appeared to be very small since the main source of the sound was the player’s own instrument. 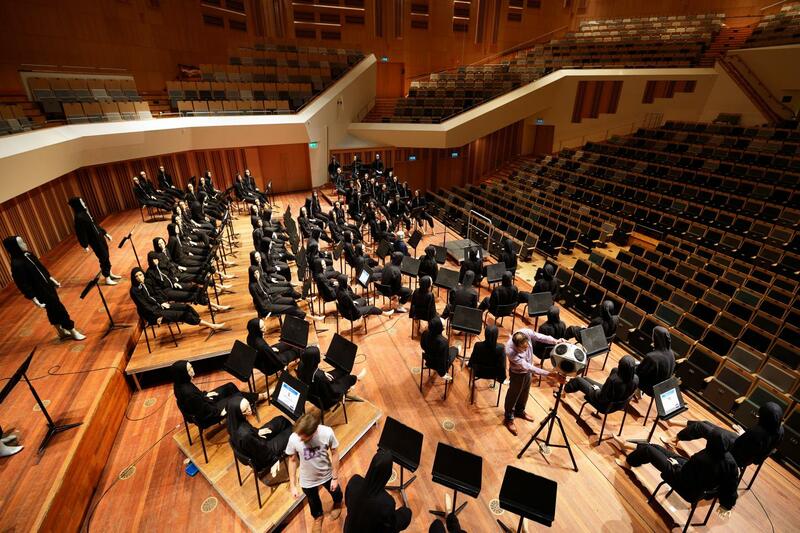 The same cause lies behind the relatively small impact (around 3 dB) of the sound-intensifying effect of small orchestra playing areas like covered orchestra pits. According to Wenmaekers it is still advisable to avoid such small orchestra playing areas but then again, the sound levels are still too high in other areas. The only thing that really helps is to play more quietly or to use earplugs. Musicians have long been advised to play using earplugs but now it has been proven that there is no other feasible measure that can be taken. There is, however, one part of the orchestra that can get away with it in part, the cello and the bass sections. These instruments produce a relatively soft sound and thus present no risk by themselves. The sound that affects the ears of the cellists and bassists tends to be generally lower and comes mainly from the other orchestra sections. So for this group there may be other interventions that are effective apart from earplugs. Another purpose of the study was to improve methods of measurement based on loudspeaker sound and microphones to get a picture of the stage acoustics. This form of objective measurement is highly desirable, especially because an evaluation of the acoustics is essential to the design and improvement of music auditoriums. Wenmaekers also showed that existing measurement methods, with only empty chairs and stands on the stage, does not provide the right picture. So in five concert auditoriums he put clothed mannequins on all of the chairs on stage to measure the effect that people would have on the stage acoustics. This proved to have such an influence that he developed a method to measure the full ‘real’ orchestra on stage, but one that costs the members of the orchestra just ten minutes of their time. What does it mean for the husband when his wife keeps her own surname?